CHELYABINSK, Russia, February 15, 2013 (ENS) – An asteroid several meters in diameter exploded in the atmosphere above the city of Chelyabinsk today at about 9:30 in the morning local time, injuring hundreds of people and damaging thousands of buildings, said officials. 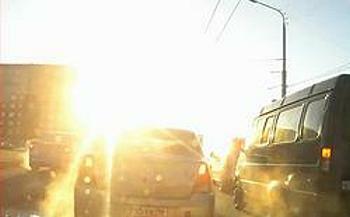 Videos of the event taken on dashboard camera, such as the four images below, show an object streaking across a clear, blue sky and bursting into fireballs with loud explosions. Trails of vapor were visible for hundreds of miles. As of late afternoon, around 1,200 people had been reported hurt, including more than 200 children, mostly in the Chelyabinsk Region, the Interior Ministry told the RIA Novasti news agency. Two people are reported to be in “grave” condition, but most of those hurt had suffered minor cuts from broken glass as the shockwaves from the meteorite shattered windows in Chelyabinsk, a city of 1.1 million residents south of the Ural Mountains in south-central Russia. President Vladimir Putin ordered emergency officials to provide “immediate” assistance to people affected by the meteorite. The Russian Minister for Emergency Situations Vladimir Puchkov has arrived in Chelyabinsk to assess the situation. An estimated 20,000 emergency response workers have been mobilized. Officials said gas supplies to hundreds of homes in the Chelyabinsk Region were cut off as a safety precaution. Some 3,000 residential buildings were also damaged, according to Chelyabinsk city officials. Background radiation levels reportedly remain unchanged. This was confirmed both by emergencies officials, and by the national nuclear agency, concerned because the region has a number of nuclear facilities. “Verified information indicates that this was one meteorite which burned up as it approached Earth and disintegrated into smaller pieces,” Elena Smirnykh deputy head of the Russian Emergencies Ministry press office, told reporters. “Current information, which is not yet complete nor confirmed, points to a small asteroid,” said Detlef Koschny, Head of Near-Earth Object activity at European Space Agency’s Space Situational Awareness program office. 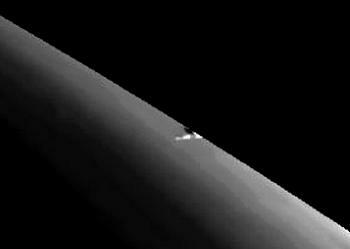 Asteroid 2012 DA14 made a flyby of Earth at 19:27 GMT (20:27 CET) today at a distance of about 17,000 miles. Early assessments of the Russian meteor indicate it was about one-third the size of 2012 DA14 and traveling in a different direction, said officials with the U.S. National Aeronautics and Space Administration, NASA. NASA officials told reporters on a teleconference today the asteroid that struck Russia was “tiny.” While NASA has identified about 95 percent of all near Earth objects, they said that meteors of this size are extremely difficult to detect ahead of any strike. They said about 80 tons of “meteoritic material” strikes the Earth every day. As for the future danger to Earth from these objects, “There are no asteroids that are headed to the Earth for certain,” said Paul Chodas, research scientist in the Near Earth Object Program Office at NASA’s Jet Propulsion Laboratory in Pasadena, California. “Today’s event is a strong reminder of why we need continuous efforts to survey and identify near-Earth objects,” said Thomas Reiter, the European Space Agency’s director of Human Spaceflight and Operations. In cooperation with survey efforts worldwide, the European Space Agency’s goal is to spot near-Earth objects larger than 40 meters at least three weeks before closest approach to Earth. To achieve this, European Space Agency, European industry and partner agencies are developing a system of automated telescpes one meter in diameter capable of imaging the complete sky in one night.